St. Barnabas Hospital (SBH Health System), the oldest continuing healthcare facility in New York City, celebrates its 150th anniversary in 2016. The history of the hospital began when it was incorporated on April 6th, 1866, a year after the end of the Civil War. 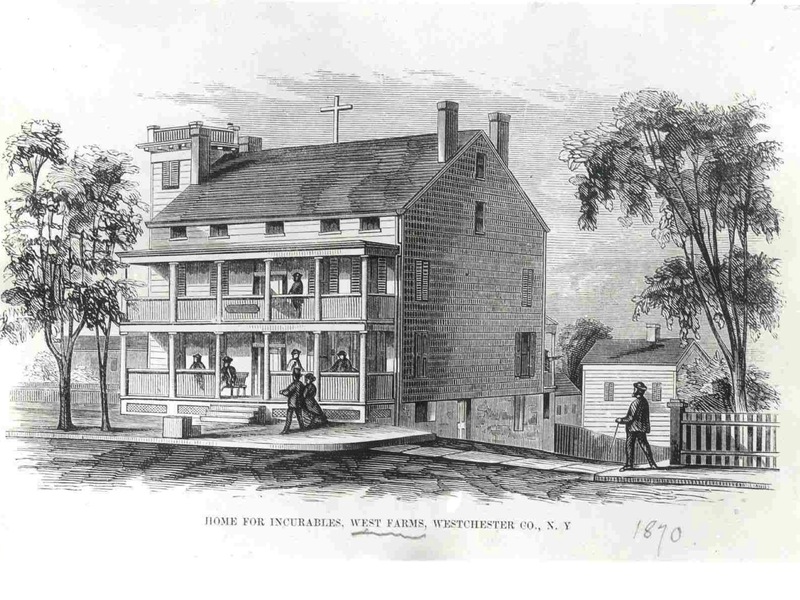 In 1867, a facility known as the “Home for the Incurables” received 33 patients at its modest frame house in West Farms (which was then an incorporated area of New York City). This would become the nation’s first chronic disease hospital. It was at a time when anesthesia was not in general use, surgery was primitive, and no definitive cures yet existed for tuberculosis, cholera, influenza, pneumonia and other diseases. These patients, who suffered from epilepsy, arthritic deformities, paralysis, senility and other chronic illnesses, could not be cared for in existing hospitals at the time. They generally stayed for a long time, in some cases for as long as 30 years. In 1874, the facility moved to its present 10-acre site on Third Avenue, where by 1911 it had increased its accommodations to 300 beds. Since about one-third of the patients were treated “without any expense whatever,” the hospital needed donations to keep its doors open. Support came from such luminaries of New York Society as Cornelius Vanderbilt (who served on the hospital’s Board of Managers), John Jacob Astor, Theodore Roosevelt and Frederic Law Olmstead. The Mills Building, a home for nurses built by Ogden Mills, later President Herbert Hoover’s Secretary of the Treasury, opened in 1926, and the Braker Building, a resident for needy elderly patients, was built in 1928. An entire new plant, which is now the main building of St. Barnabas Hospital, opened in 1931. In 1947, the name was changed to St. Barnabas Hospital for Chronic Diseases (later shortened to St. Barnabas Hospital). Vice-President Hubert Humphrey gave the keynote speech at the groundbreaking ceremony for the hospital’s West Wing in 1969. The six-story structure accommodated 188 beds in private and semi-private rooms, and also included construction of a new kitchen and cafeteria. The hospital, now with over 400 beds, was reclassified as an acute care facility in the 1970s. In the 1980s, the hospital developed a medical education program that today includes training for residents in emergency medicine, internal medicine, pediatrics, family practice, general surgery and other programs (including psychiatry, whose first class begins in 2016). The hospital became affiliated with Fordham-Tremont Community Mental Health Center (now SBH Behavioral Health) in 1988 to offer mental health services. In the 1990s and early 2000, the hospital received state designation as a Level 2 Trauma Center (and would later became the focus of two documentaries on trauma care), an AIDS Center and Stroke Center. Over the next few years, state-of-the-art ambulatory surgery and hemodialysis centers, a cardiac catheterization laboratory, a state-designated Level III Perinatal Center, an Infusion Center, an expanded hospice unit, and a federally-designated Community Center of Excellence in Women’s Health all opened. As part of its extensive outreach program, a mobile mammography program began. Upgrades were made to the laboratory and centers for cancer and cardiac care with the arrival of the most advanced technology. The hospital opened the first Men’s Health Center in the Bronx in 2015. Today, SBH Health System provides access to much-needed healthcare services in the Bronx through St. Barnabas Hospital, SBH Ambulatory Care Center, and SBH Behavioral Health. It is playing a pivotal role in the transformation of health care in the Bronx. This includes earning the highest level of certification for a patient-centered medical home, allowing patients to benefit from the newest and best model of care available. SBH has taken a leadership role in the state’s DSRIP program, as the lead partner in Bronx Partners for Healthy Communities. This includes more than 200 Bronx community-based organizations that are working together to improve health care delivery and outcomes for Bronx residents. Most recently, to help develop primary care physicians who will serve the city’s underserved communities, SBH Health System became the primary clinical affiliate of the first-ever CUNY School of Medicine.